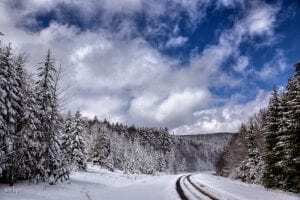 Black Mountain, in Pocahontas County, is one of the Yew Mountains, among the southernmost ranges in the Allegheny Mountains in eastern West Virginia. The mountain may take its name for the profusion of dark spruce forests along its summit. The Highland Scenic Highway runs along the crest of Black Mountain. The Cranberry Glades botanical area lies along the northwest slope of the mountain.